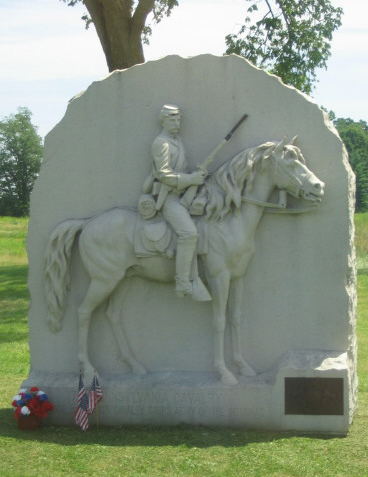 This impressive monument was placed on the Gettysburg Battlefield by veterans of the 17th Pennsylvania Cavalry. It was dedicated on September 11, 1889. Planning for the monument began in 1886 when a group of the 17th veterans met to discuss putting a memorial on their battleline at Gettysburg. Building of the monument was assigned to the Pennsylvania Monuments Commission. The goal was to create a memorial that was unique, different, and would be typical of the regiment. The sculptor wanted to use an actual veteran of the 17th Pennsylvania and George W. Ferree (a veteran of Company L of the regiment) was chosen to be the model. With much detail in the lifesize sculpture, he is dressed in his original uniform and accoutrements, sitting astride his horse, rifle raised portraying the enemy had been discovered and a warning shot is about to be fired. Made of Blue Westerly Granite. Weight is about 27 tons. Approximately 11 ft. x 9 ft. x 10 in. x 36 in. Stands near the spot where they stood watch on July 1, 1863. Located at the corner of Buford Avenue & Mummasburg Road. Sources: Online data www.geocities.com "The 17th Pa. Monument at Gettysburg"; www.waymarking.com "17th Pennsylvania Cavalry, Gettysburg, Pennsylvania-American Civil War Monuments and Memorials"; www.campcurtin.org "Information Security Activities During the Civil War". Photo courtesy of Linda Worstell.